GAZA CITY (Ma’an) — A Palestinian man from the northern Gaza Strip who was critically injured earlier on Friday was pronounced dead later in the afternoon.The Palestinian Ministry of Health confirmed that 25-year-old Ahmad Nabil Abu Aqel succumbed to wounds sustained during protests in eastern Jabaliya, when Israeli soldiers shot him in the head.Over 30 Palestinians have been killed in Gaza since the “Great March of Return” protests began on March 30.Among the dead were two minors and a journalist.Friday marked the fourth Friday of the massive nonviolent protests in Gaza, during which thousands of Palestinian refugees have taken to the heavily militarized borders with Israel to demand their collective right of return to their homelands.The six-week protest is set to end on May 15th, the 70th anniversary of the Palestinian Nakba, or “catastrophe,” when the state of Israel was created, leaving some 750,000 Palestinians and millions of their descendants as refugees.Despite widespread outcry from international rights groups who have condemned Israel’s excessive use of forces against the civilian protesters, Israeli has maintained its open-fire rules for the Gaza border. Saudi Arabia’s King Salman bin Abdul-Aziz Al Saud talks during the opening of the 29th Arab Summit in Dhahran, Saudi Arabia, April 15, 2018. The Saudi king declared the April 15 Arab League Summit held in the city of Dhahran in eastern Saudi Arabia to be the “Jerusalem Summit,” yet many Palestinians doubt this show of support will lead to lasting change. When the Saudi leadership decided to move the annual Arab League Summit from the Saudi capital of Riyadh to the eastern Saudi city of Dhahran, it appeared that the April 15 summit would be called by the name of the city it was being held in, or at least another city within the kingdom. The last summit, held on the shores of the Dead Sea in Jordan in March 2017, was called the Amman Summit. But midway through the public opening statements and as he was introducing Palestinian President Mahmoud Abbas, Saudi King Salman bin Abdul-Aziz Al Saud announced a change. “This summit will be called the Jerusalem Summit,” the king told the 15 other heads of state and six other representatives of the Arab League. He also announced a number of donations, including $150 million for the maintenance of the Islamic endowment in Jerusalem and $50 million to help cover the annual budget of the United Nations Relief and Works Agency (UNRWA) for Palestinian refugees after the United States cut its aid to the agency earlier this year. The United States had suspended in January 2018 a $65 million portion of its aid to UNRWA in protest of the Palestinian government’s boycott of US officials following Donald Trump’s declaration on Jerusalem. It is not clear exactly what made the Saudi monarch decide to raise the profile of Jerusalem. The king’s son, Crown Prince Mohammed bin Salman — who is also the kingdom’s defense minister — had just concluded a wide-ranging tour in the United States between March 19-22 that included a visit to the White House. Throughout his tour, Mohammed made little mention of Jerusalem. In fact, in one interview with The Atlantic, he appeared to be moving closer than ever before to unilaterally recognizing the state of Israel in an exchange that drew a striking headline. Hussein al-Sheikh, who was a member of the Palestinian delegation to the Arab Summit, told Al-Monitor that the issue of Jerusalem is always a priority for Arabs; therefore, the change of the name is not out of the ordinary for the Saudi monarch. Hanna Issa, secretary-general of the Islamic Christian Commission in support of Jerusalem and the holy sites, told Al-Monitor that the decision by the Saudi monarch came as a direct result of a Palestinian request. “President Mahmoud Abbas personally made the request from King Salman in order to make it clear to everyone that Arabs are united in their support for the Palestinian position on Jerusalem,” he said. The Arab Summit’s final communique April 2 also echoed the same theme of support for the Palestinian position. “We affirm the illegality of the American decision to recognize Jerusalem as the capital of Israel, as we categorically refuse to recognize Jerusalem (Al-Quds) as the capital of Israel, where East Al-Quds will remain the capital State of Palestine. We warn against taking any action that would change the current legal and political status of Al-Quds,” the communique read. The money earmarked for the Islamic endowment in Jerusalem was made by King Salman while introducing President Abbas. This left a mystery as to how exactly the money will reach Jerusalem. Jordan is the custodian of the holy places in Jerusalem, and the Jordanian Ministry of Waqf runs the Islamic endowment in Jerusalem. A report on Al-Jazeera’s website April 18 asked whether the Saudis are planning to channel this aid via Jordan or if they have other plans. Akhbar al-Balad, in the aforementioned editorial, also asked whether or not the money will be channeled by way of the Jordanian Waqf. Meanwhile, Issa assured Al-Monitor that the money will be transferred to the Jordanian Waqf to be spent in Jerusalem. The name change, the donation and the communique certainly were welcomed by Palestinians and their supporters, thus cutting off the potential of Washington trying to keep East Jerusalem away from any “ultimate deal” that the White House is trying to produce. Many Palestinians hope that this strong Arab support for Jerusalem will close off any chance that the United States will try to take the holy city “off the table,” a reference to what Trump had boasted about. But having seen this charade before, few if any are confident that this Arab position will not erode and compromises on this essential Arab demand will not be made. 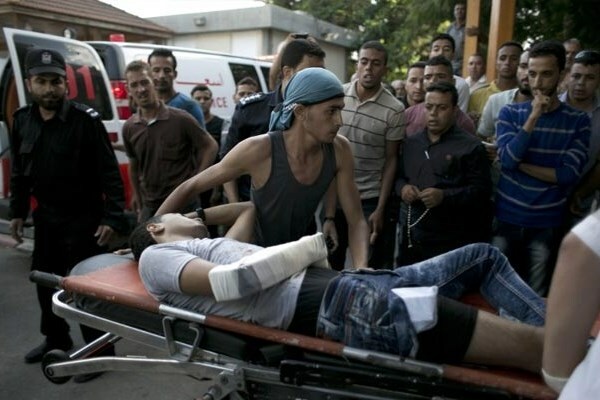 Dozens of Palestinians were injured on Friday during confrontations with the Israeli occupation forces (IOF) in different West Bank provinces. Two Palestinian youths were injured by rubber-coated metal bullets during clashes in Bab al-Zawiya area in al-Khalil city. Other clashes were witnessed in al-Bireh, Bil’in, al-Mazra’a al-Gharbiya and Nabi Saleh in Ramallah during which the Palestinian youths set dozens of tires on fire, raised Palestinian flags and chanted slogans condemning the Israeli crimes. Following clashes between Palestinian citizens and Israeli settlers, the IOF stormed Burqa town in Ramallah, raided some Palestinian houses and wreaked havoc on them. 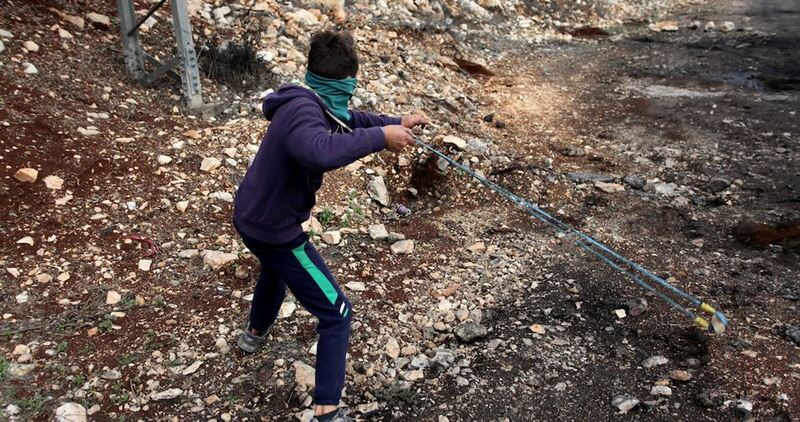 Dozens of Palestinians chocked on tear gas while an right-year-old child was injured after being hit with a rubber-coated metal bullet during the weekly demonstration in Kafr Qaddum east of Qalqilya. Further, the IOF soldiers were deployed in large numbers at the entrance of Azzun town east of Qalqilya. They arbitrarily stopped a number of Palestinian cars and searched them. Dozens of suffocation cases were reported during clashes in Beita, Kafr Qalil and Huwara towns in Nablus. Hundreds of Palestinian took to the streets following Friday prayer to participate in protests launched all over the West Bank and Jerusalem in support of the Great March of Return in Gaza. The national Committee of the Great March of Return and Breaking the Siege announced that next Friday march will be held under the theme “Revolutionist Youth Friday” within the events of the Great March of Return along Gaza eastern border. In a press conference on Friday evening, the committee said that hundreds of thousands of Palestinians participated in Friday of Prisoners and Martyrs on April 20. At least four Palestinians were killed and hundreds of others were injured after Israeli occupation forces targeted the participants by live bullets and tear gas grenades along Gaza border, according to Health Ministry. 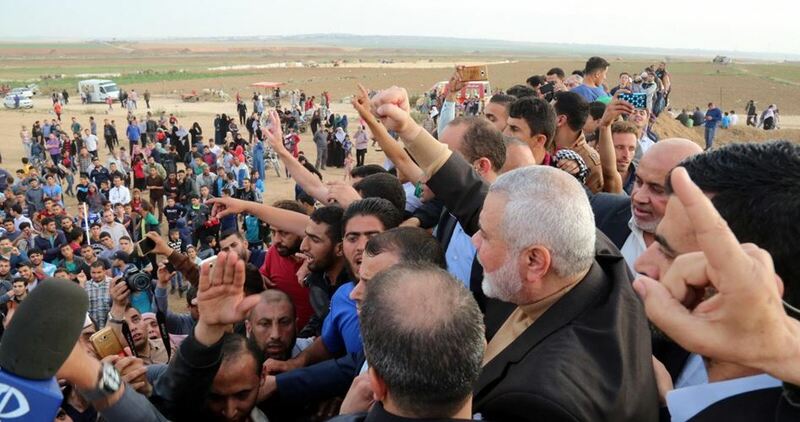 Head of Hamas’s political bureau Ismail Haneyya has called for massive participation in the March of Return protests slated for May 15 to mark the 70th Nakba anniversary in all areas of occupied Palestine. “Be prepared for the human flood on all Palestinian borders inside and outside the occupied territories on the Nakba anniversary,” Haneyya said during his participation in a protest on Friday in a Gaza border area. He made his remarks in response to Israeli threats to attack Gaza protesters if they continued to rally near the border fence. “The March of Return will remove all barbed wire and borders to prepare for our return to the occupied Palestinian land,” the Hamas official emphasized. He affirmed that Israel’s threats would only boost the protesters’ fortitude and their determination to continue their March of Return rallies and would never frighten them. On Friday morning, the Israeli occupation army dropped warning leaflets on Gaza protest areas, saying the lives of protesters would be in danger and threatening to use deadly force against them if they approached or rallied near the border fence. The International Commission to Support Palestinians’ Rights (ICSPR) condemns the Minister of Foreign Affairs statement on in the determination of his country (the Republic of Guatemala) to move its embassy from Tel Aviv to Jerusalem on 16 May. The International Commission to Support Palestinians’ Rights (ICSPR) followed with deep concern the announcement by the Minister of Foreign Affairs of Guatemala, “Sandra Joviel”, yesterday that her President, “Jimmy Morales” will attend the ceremony of transferring the Guatemalan embassy from Tel Aviv to Jerusalem on May 16. According to the Guatemalan Constitution as a secular State, and out of purely religious standpoints, the President is not entitled to make decisions that affect the peaceful coexistence of the society. It should be noted on December 24 last year, Morales announced that his country would move its embassy from Tel Aviv to Jerusalem, to be the first country in the world to follow the United States example in its decision to relocate its embassy to the Holy City, following Trump’s announcement that America recognizes Jerusalem as the capital of the occupation and will transfer its embassy to it. In addition to the United States and Guatemala, six other States have decided to move their embassies from Tel Aviv to Jerusalem, which are: Honduras, Togo, Marshall Islands, Micronesia, Republic of Palau and the Republic of Nauru. The International Commission to Support Palestinians’ Rights (ICSPR) affirms that such potentially and unprecedented steps are dangerous and aimed to legitimize the settlement and annexation operations carried out by the occupation state in Jerusalem. These operations contradict the principle of the inadmissibility of the annexation of the occupied territories to the occupation state, which is considered by the jurists of international law as the most important principle of the principles established in international law that regulates the relationship between the occupation state and the occupied state and its territories, as it constituted a clear violation of international law. ICSPR considers that any possible implementation of the transfer of Guatemala Embassy from Tel Aviv to Jerusalem constitutes a clear violation of the principles of international legality, international humanitarian law and all international resolutions relevant to the Palestinian cause since its inception, in particular the Security Council and General Assembly resolutions on the city of Jerusalem. 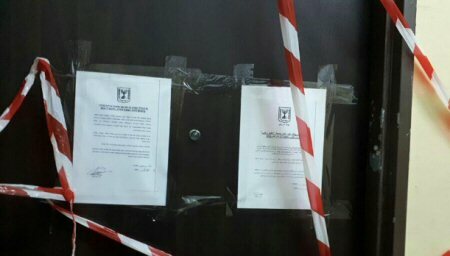 ICSPR urges the international community and the free world to condemn these steps and to work on a UN resolution to boycott Israel for failing to comply with UN resolutions, especially the UN Security Council Resolution 2234 of 23 December 2016 on the illegality of the Israeli settlements. 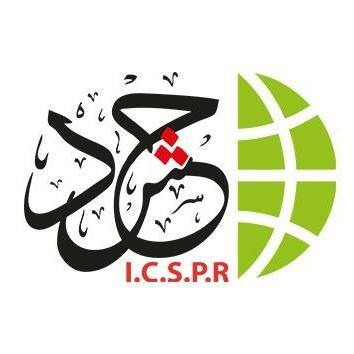 ICSPR demands the Palestinian leadership to suspend the diplomatic relations with the State of Guatemala, end the security coordination, and withdrawal the recognition of the occupation state and to establish a plan to support the steadfastness of the people and institutions of Jerusalem andform a unified national authority in the city. ICSPR urges the Arab and Islamic countries, including the League of Arab States and the Organization of the Islamic Conference, to initiate international, political, diplomatic and legal actions to prevent and counter this trend, including the call of the League of Arab States and the Organization of the Islamic Conference for urgent and extraordinary meetings to formulate a unified Arab position on the US foreign policy possible changes on regional issues, especially the Palestinian issue. 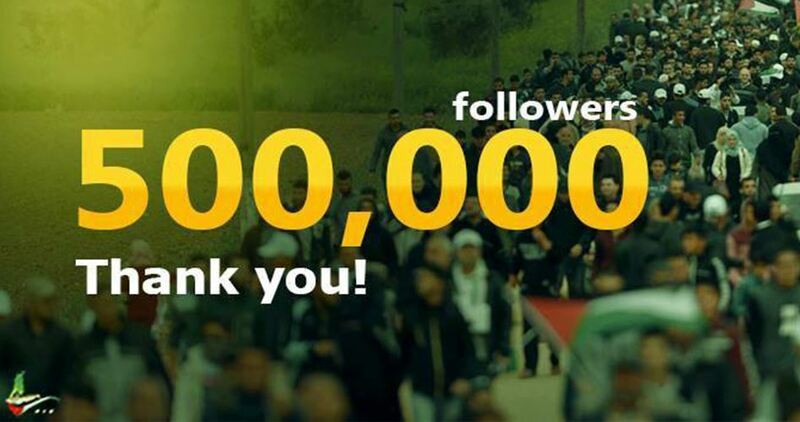 The Palestinian Information Center (PIC) has made a new Facebook achievement recently after its followers on its English page surpassed half a million people in early April, 2018. The PIC administration hailed such interaction with its English page as one of the goals it seeks to achieve to convey the message of Palestine to the world. According to the administration, its English Facebook page is aimed at reaching out to the Western world and providing them with information on the Palestinian people’s usurped rights and their national cause as well as their daily suffering under occupation. The page is also important to confront the Israeli media propaganda machine, which aims to smear the Palestinian people and erase the eternal truth that the Palestinians have the right to defend themselves and claim their rights, mostly importantly their right to live in peace on their own land with no occupation. A Palestinian legal committee on Friday said that the Israeli occupation forces are committing a war crime by killing the peaceful protesters taking part in Gaza’s Great March of Return. The Legal Committee of the Higher National Committee of Return March and Breaking the Siege said in a press statement that the deliberate killing of peaceful protesters is a war crime under international humanitarian law. 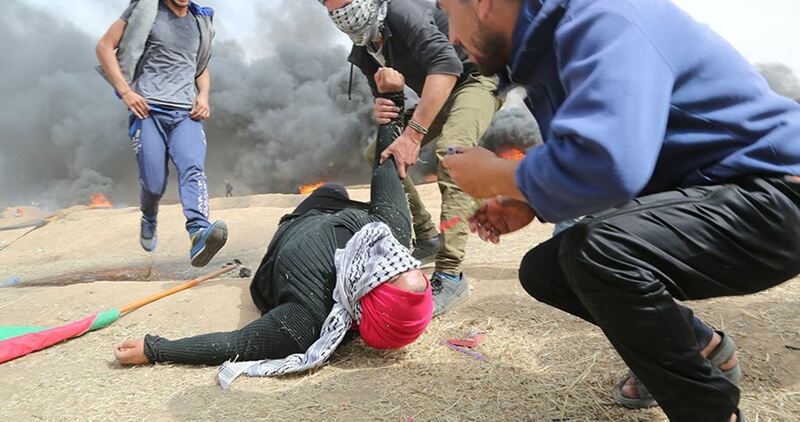 The Legal Committee warned of the consequences of the international community’s silence vis-à-vis the Israeli crimes against Palestinian demonstrators which serves as a green light for Israel to commit further crimes. It also called on the international community and UN to assume their legal and moral responsibilities and protect Palestinian civilians. Earlier Friday, the UN asked the Israeli government to reduce the use of lethal force and called on Palestinians to avoid friction with the Israeli forces near the border fence between Gaza and the 1948 occupied territories. Deputy spokesman for the UN Secretary-General Farhan Haq said during a press conference that the UN is following with concern the situation in Gaza, stressing that using lethal force must be a last solution. The Israeli occupation army on Friday killed four Palestinians and injured hundreds others during Return protests along Gaza’s eastern border fence. 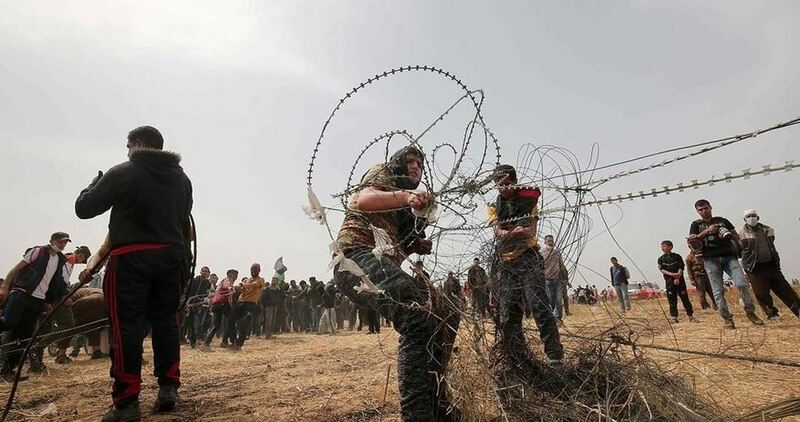 At least 39 Palestinians have been killed and thousands injured by Israeli gunfire since the launch of the Great March of Return on 30th March. 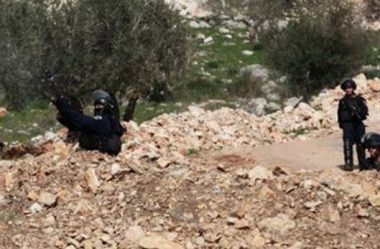 Israeli soldiers shot, Friday, a Palestinian child with live fire, and caused many to suffer the effects of teargas inhalation, in the al-Lubban ash-Sharqiya village, south of the northern West Bank city of Nablus. The soldiers assaulted the Palestinians who marched in their village, protesting the ongoing illegal Israeli occupation of Palestine, and the escalating violations against them, their property and holy sites. Medical sources said the soldiers shot the child, 16, with a live round in his leg, before he was rushed to Salfit governmental hospital. The soldiers also fired many gas bombs and concussion grenades, causing many Palestinians to suffer the effects of teargas inhalation.